"We recorded the following week at CIMP....this time I knew what to expect. With this group (Blaise Siwula on alto and John Bollinger on drums), I used a 12 string acoustic guitar. From the get-go the three of us burned. The energy was so high that Bob Rusche was taken aback. We thought we nailed it, but Bob wanted more the next day, so we recorded for three more hours. Again the energy was high, we left exhausted but exhilarated Then again, when the recording came out, the volume wasn't high enough." 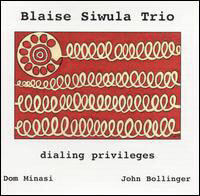 "Veteran improvising alto saxophonist Blaise Siwula packs a potent punch on Dialing Privileges. Along with the somewhat legendary guitarist Dom Minasi and drummer John Bollinger these New York based musicians not only provide a mini-clinic on the art of improvising yet perform with a distinctive touch which elevates this release to the top of the heap."